Beverley Minster House07944385149work Self-cateringRecently awarded a 5* grading by Visit England, this newly restored Grade II listed Georgian town house lies in the shadow of historic Beverley Minster. It's central location offers guests an ideal base from which to explore the many attractions and amenities of this picturesque market town. The 3 storey property sleeps 6 people, with master ensuite bedroom and 2 flexible twin/superking bedrooms (1 with en-suite facilities), a bathroom, lounge, cloakroom, spacious open plan living/dining area and a a fully equipped kitchen with patio doors leading onto a secluded courtyard garden. Free WiFi and on street parking are available throughout your stay. 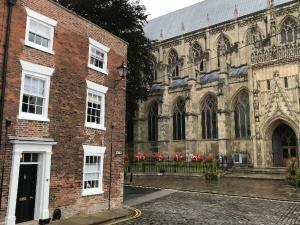 Recently awarded a 5* grading by Visit England, this newly restored Grade II listed Georgian town house lies in the shadow of historic Beverley Minster. It's central location offers guests an ideal base from which to explore the many attractions and amenities of this picturesque market town. Whether you are looking to explore Beverley for the first time, attending the races or one of the town's many festivals, or just planning a get-together with family and friends, you can be sure of a warm welcome in the comfort of Beverley Minster House. Sorry no pets. Short breaks available (minimum 3 nights). Please call us for more details. From the South: enter the town via the A164 and turn right at the double mini roundabout onto Keldgate. Follow the road around the back of the Minster, then take a left turn opposite the Sun Inn. Turn immediately first left onto Minster Yard North and Beverley Minster House is on the right hand corner of Highgate/Minster Yard North, directly opposite the Minster front door. From the North: follow the one way system around the town, past Tesco and the fire station. At the roundabout, take a right turn and then then 2nd left opposite Wednesday marketplace onto Highgate. Beverley Minster House is the very last house on the left, directly opposite the Minster front door. Beverley is easily accessible by road with the M62 and Humber Bridge approximately 10 miles away. The town’s train station is only 500 yards from Beverley Minster House, with direct trains to and from Sheffield, Doncaster and up the coast to Bridlington and Scarborough. The mainline station at Hull, a 15 minute journey, connects with main lines to York, Manchester, Leeds, London and beyond. Beverley bus station is also in the town centre, with direct services to the coast, York and Hull Bus and Rail Interchange for National Express and other connections.